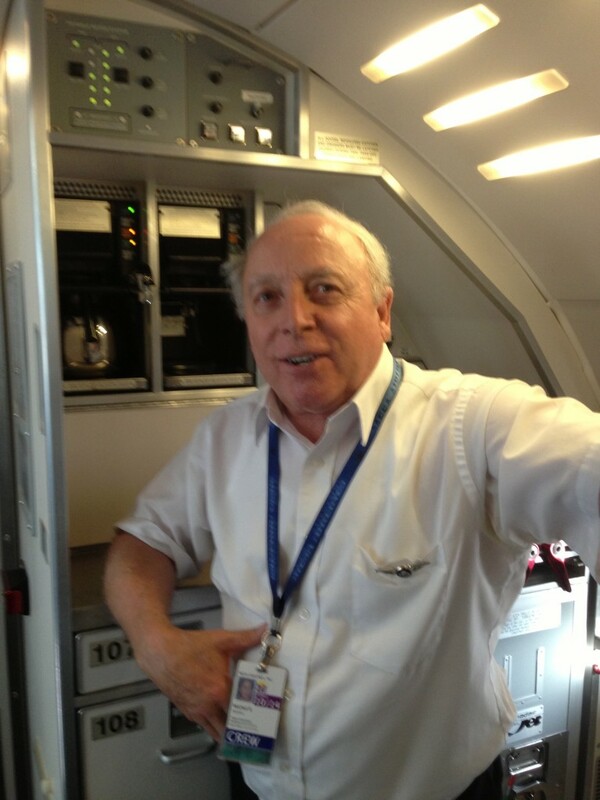 On a recent US Air flight from Phoenix to San Antonio, we learned that it would be the final work flight for Blaine (see picture), who worked for the airline more than a decade. The flight lasted just two hours and was uneventful. However, Blaine had his fellow flight attendant take a picture while standing in the aisle. Passengers were informed that they could cover their faces or look away if they did not want to be part of the picture, but I think most participated. I was sitting right next to Blaine, and gave a big thumbs-up. While observing Blaine’s routine, one would not have known that he was making his final flight. On this segment, he tended to the First Class cabin. He provided special snacks and alcoholic beverages upon request. He was attentive and carried a friendly smile. BLAINE: Thank you! This is the final flight for me. ME: How does it feel finishing up your career? BLAINE: This is my second career, and I’m ready to call it quits. I’ve put in enough work over my lifetime. It’s time to enjoy the next stage of my life. BLAINE: I actually have two homes: Phoenix and Vancouver, Canada. I really like Vancouver, so that is where I plan to spend most of my time. It’s a beautiful city, and I have many friends in the area. I will be there soon! ME: It’s great that you are ready to make the transition. I can tell you’re happy. BLAINE: I decided only recently to make this decision, and it feels right. I could work for a couple more years, but for what? The returns I can expect just don’t justify the investment in time. Don’t get me wrong … this has been a great career. I have met many great people, from co-workers to customers. I made the right decision to work here at US Air for so long. After our conversation, I began to think about retirement. I understand it’s a “down the road thing” for me, but seeing someone who is right on the doorstep makes me pause and contemplate the decision. It was obvious that Blaine was ready to enjoy retirement. From what he told me, he didn’t think about it too long. I understand that some people keep putting extra years in hopes of increasing the value of their retirement program, but there are downsides to this decision. When are you going to be happy? If you add $15,000 for two more years of work, will the investment in time be worth it? The takeaway from my discussion with Blaine is that you should have a clear idea when it’s time to enjoy your life after work. Each of us will balance variables that are important, but the point is that the day is coming, and I want to have the same confidence that Blaine showed. He knew the time was right.